Social media metrics that really count! Social Media Class Assignment: Discuss social media metrics. Which are important and why. To approach this assignment, I narrow my answer to Twitter and Facebook as they continue to remain the premiere social media platforms and do provide detailed analysis within their platform. Before looking at any analytics – a social media manager must define their target audience. High numbers are great, but if the high numbers are not in your target audience, some re-evaluating is necessary! However, an initial look of metrics will help you to come to that target audience determination. To obtain Twitter metrics, sign into your Twitter account from a desktop computer (not a mobile app). In another browser window, type in http://www.analytics.twitter.com The stats for the Twitter account you are signed in for will appear. If you have multiple accounts you must sign out of Twitter and repeat the process. Followers. Unlike Facebook, the number of followers is important. Unlike Facebook, the people who follow you have the potential to see all of your tweets. Although Twitter does distinguish between Top Tweets and All Tweets, it is intuitive and therefore increasing one’s followers is key. Impressions. This is the equivalent of Facebook’s Reach. This metric measures the potential to see your posts. But with the rapid speed that Twitter Feeds roll across your screen, impressions alone don’t cut it. It is what people do with what they’ve seen that counts, and that is called Engagement. Engagement. This measures the conversations you attract on Twitter. The back and forth, the Retweets, Replies and Favorites. The mentions you receive – the pushing and the pulling. The conversations you start as well as receive. TA will provide a series of colorful graphs on the right side – average daily metrics, such as links that were clicked, but it does not provide you with information as to what links were clicked. That level of detail comes with paid or premium services such as Hootsuite or TweetDeck and the link must be shared via that platform in order for it to track the link activity. TA will also provide you with an Engagement Rate or ER, shown in percentages. This takes into account your Follower number, the number of impressions possible and the activity from actual engagement. It will calculate a number that is shown on the default screen of TA. A tweet that was seen by 97 people could have a higher ER percentage than a tweet that was seen by 600 people. Influencer Identity or Klout. Not exactly a metric, but on Twitter it is important to know the intrinsic value of the people and companies with whom you are interacting. If you use Twitter on browsers such as Firefox or Google Chrome, the Klout score of the Twitter account will appear. The range is from 1 to 100, and while not fail safe, the higher the number, the more influential the Twitter account is. There is benefit to association with higher values as part of an engagement strategy. Referrals measure who sends traffic to your website or blog. These can be obtained via Google Analytics for most websites by creating a free account or come built in with WordPress’s own statistics platform. Referrals tell you how many people visited your site (referred) from specific social media platforms like Twitter and Facebook. A Twitter referral shows as t.co. You want to be aware of who is sending traffic to your website or blog. If you are sending out a number of links, but not getting any hits, you may have to rethink your strategy. Trending Hashtags. Technically, this may not be a metric. But the topics that are trending in Twitter or in your area (found with such tools as Hootsuite) – is vital so that your content can be relative, whenever possible and appropriate, and can make the connection with your audience. Knowing what hashtags your followers and target audience are using can make or break your social media effort. Followers (Your Audience). 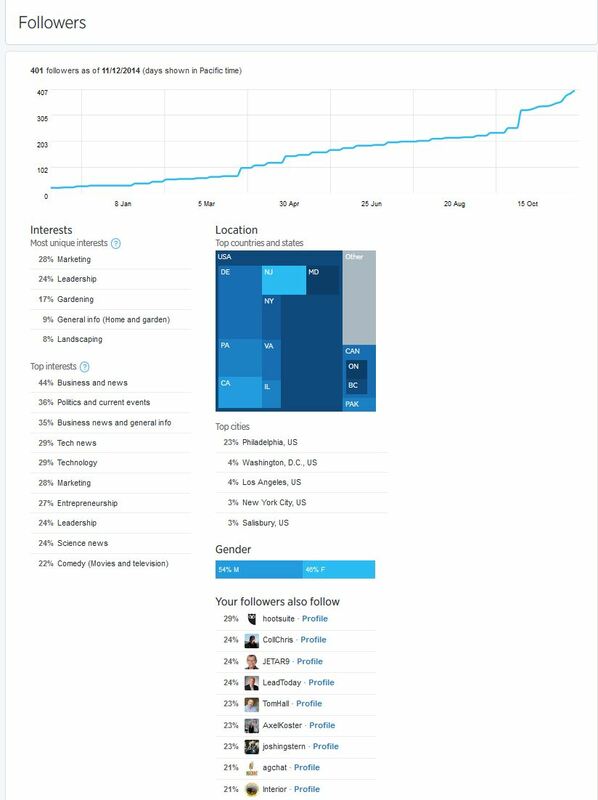 TA provides you with a metric of your followers including where they are, what their interests are, the gender and your growth as an account on Twitter. TA provides a graph showing your follower progress. As long as it goes up, consider yourself on the right track. A sudden leap can result in a sudden drop. Sustaining an steady upward trend is key. If your Twitter brand is mixed, e.g., agriculture, gardening, and social media, the audience for one should not be put off by the posts on another topic if you are authentic and if the profile explains the diversity. My profile does. Being authentic and a real person is vital. In my case, the garden/ag audience tolerates and may even appreciate the social media content and vice versa. Twitter shares what the top interest of your followers are. Why would you want to know that? Well, if you want them to retweet your content, then you must post content of interest to your audience. This allows you to see if you are reaching your target audience. Lastly, Twitter shares the location of your followers. Not surprisingly, my home state has the lion’s share. But I am reaching beyond? Is that my objective? Do I want a national audience or a local one? Is it yours? Using Analytics.Twitter.com is pretty straightforward. There are colorful graphs which will give you initially a 28-day snapshot of your activity. You are able to change the date range. Page Likes. Place less emphasis on page likes!!! Page likes no longer mean real followers! Reach or Post Reach. Think of Reach as new audience. The potential to reach other people, outside of your page likes. These could be friends of people who like your page. You may want to strategically budget to pay for expanded reach with the hope of more organic reach to come. Engagement. Engagement measures how involved they are with your content. Engagement measures how the people who saw your post, interacted with it. Engagement goes hand-in-hand with Reach. Engagement measures people who like your content, comment on your content and share your content. In order from best to worst, sharing is the best followed by comments and likes. The more people interact with your content the better. Audience demographics. Do you know who your target audience is? Are you reaching them? Referrals. 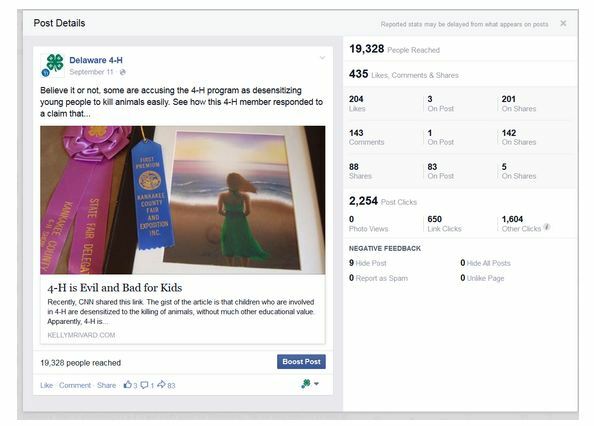 How is your Facebook page being found? 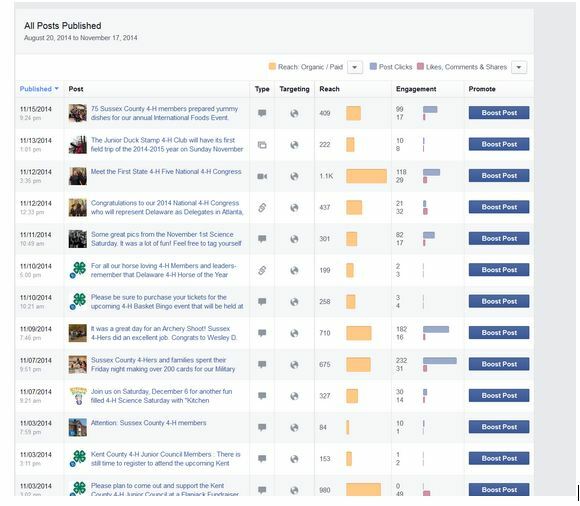 Facebook will show an overview of your key metrics. Don’t be obsessed with page likes! Reach and Engagement counts! Does the metrics of your page demographics match your targeted audience? You must know who you are reaching on Facebook before you can strategize a plan to reach a targeted audience. Facebook reveals the people – the demographics of your followers. It is a great glimpse to see if you reached your target audience. Evaluate the timing of your posts. Did a post just sit there and do nothing? Try posting it again (with a few days space in between) and see if it gets traction on another day or time. Post overviews are very handy! You see the date and time something has been posted and the bigger the Reach and Engagement bars are the better. Try staggering and repeating a post at different times to see if it resonates better on a day, evening or weekend. It can make a difference! In the above selection, if you click on the actual post title, it will open to a larger detail of the post. What types of posts generate the most traffic and engagement. A positive number tells you what resonates and what you should re-attempt! This particular post ‘s reach far exceeded the page likes of 902. That is because the audience engaged, e.g., they liked it, commented on it and shared it on their timeline. 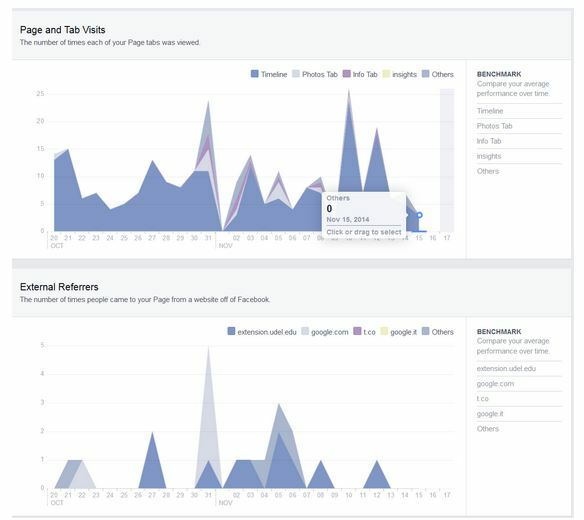 Who is referring traffic to your Facebook page? Can you use your Twitter account to occasionally market a Facebook post? Is the Facebook link on your website hard to find? How are audiences finding your site. Are you getting the referrals you desire and need?